When Sir Alex Ferguson chose former Everton Manager David Moyes as his successor to manage the legacy he built at the one-time fortress of Old Trafford, I was apprehensive and feared the worst. But again, this was the decision of the great Sir Alex Ferguson and I knew better than to question this decision. Apparently, I was wrong. Ferguson for all his greatness is still human after all. Moyes has proved himself to be the chink in the seemingly impenetrable image of Sir Alex Ferguson. Fifteen matches into the league and it has become apparent that Moyes is drowning in the over-sized shoes his predecessor left behind. He has succeeded in demystifying the club’s greatness much so that the awe of greatness that heralded our arrival against any club has vanished. Even the little clubs can now hope to get a piece of United and actually go on to get it! At the beginning of the season, I realized that Moyes would not perform miracles overnight and decided he needed time. I erased from my mind all thoughts of retaining the league title and focused on a spot at the UEFA Champions League next season, the specific preserve of Arsenal fans. However, it is beyond doubt now that the hope of a spot at the UCL is fast becoming a mirage. With three back to back home loses, I have decided to put things in perspective. Manchester United currently sits ugly at the 9th position in the Premiership. This is eerily familiar with Moyes and it brings me to the conclusion that the Moyes at United is the same Moyes at Everton. He has shown a remarkable consistency with mediocrity that appears to be a trademark. This is a guy who has been in the Premiership for over 15 years without a silverware to show for it. I think somehow, Moyes still believes he is coaching Everton. How else do you explain a coach who came into a club with so much money at their disposal and managed to make just one mediocre signing in the transfer window? As if that wasn’t bad enough, it had to be from Everton! Word on the grapevine has it that before Mezut Ozil was sold to Arsenal, he was offered to Moyes who stubbornly refused and decided to continue chasing fools gold in Cesc Fabregas. It was crystal clear that there was a gaping hole in the midfeild which needed to be plugged with a creative midfeilder; everything that defines Ozil, yet he kept bidding despite several rebuffs without making contingency plans should the pipe dream fail. Manchester United under Moyes has hobbled and is now on a downward spiral. With fans like me now having nothing to look forward to every weekend with the unique transformation of the club from superb to pathetic, it is time for the Board of Manchester United, especially Sir Alex Ferguson to swallow the bitter pill of the truth that Moyes is not of United stock and start searching for a replacement. Granted, the team is quite ordinary and it has never been more clearer that the imposing image of Sir Alex, his foresight and tactical dexterity made the club what it is today. A smart coach would have made massive changes in the team, besides changing the backroom staff and started to build his own legacy but not Moyes. He is less than half the man Ferguson is and yet hopes to achieve results with the ordinary team Ferguson made super. That is impossible! My advise to the board: cut your loses now while you still can and save us the trouble of wondering how we took a free fall from the top of the table to the relegation spot because at this rate, with Moyes, it certainly is not looking impossible anymore. Worse still is the fact that Moyes is beginning to make Manchester United look like a sinking ship, a no-go destination point for world class players who would normally have loved to come to Old Trafford. I just hope Robin Van Persie is not regretting his decision to join United just yet. My ten kobo on the issue and yes, I DEY VEX!!!!! Very little managerial skills?? Who are you? Taking LFC out of d C1C and trashing Bayer Leverkussen at home was Roy Hodgson’s work, right? He told all his defenders to go to sleep so he can just concede late goals? If a team was built to be failure-proof, d team shouldn’t compete then. I’m sure u know what the word ‘competition’ means…. You guys call yourself fans? Giving up so soon? We’ve only faced for 4 months what Arsenal faced for 8 years and they still stuck with the team and the manager. There are 20 teams in the league, not one! C’mon!! This rant ain’t neccesary! A fan with the wrong mentality. Great work Moyes, great work! Its always refreshing to see football fans who cancriticize their own club, coach and board. Heck, even investors would complain at flunks. Nice piece Malcolm. Only that it took a loss to Newcastle to realise what we realised the day Ferguson suggested Moyes. SMH. I insist tho’ that Man U will still finish in a champions league spot not because of Moyes but because Ferguson I imagine will definitely call in at some point and give his magical pep talks. Heck I don’t know what he says to people that makes it easy for him to succeed. He even says magical stuff to referees! A Chill pill will help… A chill pill will. 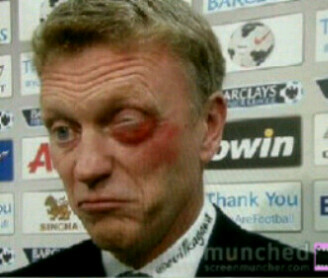 Though am not a Man utd fan but I think Moyes can be effective judged from next season. The Man utd team as it is now is in Transition. The club was always going to take a dip however slight. a job someone else had done for 20 years+ would definitely need some stability time for a new person. The patience of United fans is really quite short. imagine someone even blaming concession of late goals on him. like he asks his defenders to sleep off and allow the late goals. Give the man some time. granted he erred in not buying but to question his abilities based on current form is a bit myopic (in my opinion). Posed as a fan earlier, I must say this is just not very supportive of the writer of this article and every other fan alike? U support a football team not a governing body e.g UEFA with which victory is always certain. As a football fan, I should expect success as much as I should expect failure, expect heartbreak and disappointment as much as elation and euphoria. But calling for a manager’s head before even half of a season with those mammoth-sized shoes he’s trying to fill is totally childish, incomprehensible and IMO stupid unnecessary gibberish baby chatter. Even Sir Fergie’s first few games was no smooth ride. Emulate the passionnd patience of the Liverpool faithfuls and the Gooner Family!! I may not know much but calling me stupid for airing MY OPINION about a club I support passionately on MY BLOG shows your level of intelligence which is far from up there. I won’t condescend to your level where you can beat me with your extensive experience. You’ve vented twice in the last few minutes. You can run along now and do something useful with your life. Hilarious! I can understand that you’re disgruntled, shows you love the team but I didn’t call you or anyone stupid. I won’t do that. But for all you said to me, I can’t get mad at you. It was a low move but I get you obviously not happy with team. I tender my apologies and won’t hit u back with words!! Have a great day! Ta ta!